Are changes happening in Avondale development or gentrification? Drive down Reading Road in Avondale and you will see that a lot is changing. Avondale appears to be in the middle of a building boom. CINCINNATI — Drive down Reading Road in Avondale and you will see that a lot is changing. Avondale appears to be in the middle of a building boom. "Every community goes through certain changes," said Avondale resident Tony Moore. "Avondale happens to be at a point where development is really taking off." Moore has owned the Avondale Food Mart on Reading Road for eight years. He's lived in the community for more than 40. And his business happens to be located between two major developments. The new Avondale Town Center is being built to the north. The planned Innovation Corridor at Martin Luther King Boulevard and Reading Road is to the south. "Is it good for Avondale?" Moore said. "We have to change. We know that. Our concern is we want to make sure that we're part of the change." 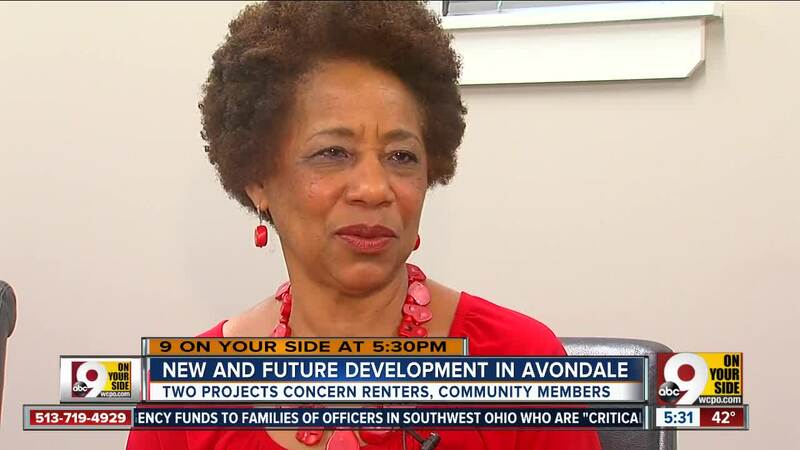 Patricia Milton has been president of the Avondale Community Council for more than 10 years. "The strongest things that I feel that we have been able to do is be involved in the planning of what goes on in this neighborhood," Milton said. The Avondale Community Council has been at the table for discussions about numerous developments in the area, according to Milton. She said the council wants to make sure Avondale residents have a voice. "There's nothing different in Avondale," Milton said. "We want the same things. A place where people can live, work, play, pray, invest, do business." Both developments will bring new residents to Avondale. The Avondale Town Center will include 119 one- and two-bedroom apartment units. The majority will have market rate rents. Fewer than 10 units will be subsidized. Milton said Avondale has about 12,000 residents. With more than 70 percent of residents being renters versus homeowners, Moore said that creates vulnerability in the community. Some of that vulnerability comes in the form of residential property investors. "They see that improvements are being made in the community," Milton said. "All of a sudden, they have money to fix their building up and charge more." David Thomas has already seen it. He has lived in Avondale since his family moved there from the West End in the 1960s, when he was 7. He said he recently tried to rent the home he grew up in and was shocked at the price. "I wanted to rent the second floor," said Thomas. "She (the landlord) said $1,200 a month. I'm like 'huh?'" Milton said, "People are concerned about their own livelihood. They're concerned about, and rightfully so, will I be displaced? What will happen to me? Where will I go?" Milton said the community is already studying housing trends in the neighborhood based on information collected by the Uptown Consortium. "It has to be very intentional because gentrification is happening all over the urban core," Milton said. "And, we have always said we don't want anyone who lives in Avondale to be displaced." Meanwhile, Milton said about 30 Avondale residents are learning about becoming homeowners through the Home Ownership Center of Greater Cincinnati. She said the goal is to get 100 Avondale residents into the program. "We want there to be more homeownerships," Moore said. "We want there to be a diverse population, a diverse income set." As for Thomas, he said after more than 50 years he doesn't plan to stay in Avondale. "I've been here since 1960," Thomas said. "It's time to go." All during 2019, 9 On Your Side will bring you stories about transportation and regional growth as part of a series called "Move Up Cincinnati". You can comment or send us your story ideas to moveupcincinnati@wcpo.com.